Westport PAL Girls Lacrosse strives to find coaches with a combination of good lacrosse knowledge, the ability to teach skills and the talent to positively relate to young athletes. We hope to shape the skills and enthusiasm of our players so that they develop a love for the game of lacrosse. Paid coaches, high school varsity athletes and parent volunteers are each utilized in various parts of our program. Each team at each level of the travel program will have two paid coaches leading the team. All PAL coaches are required to hold several certifications including: CPR/AED/First Aid, National Youth Sports Coaching Alliance (NYSCA), Heads Up Concussion Training and second year coaches must also pass the US Lacrosse Level I or Positive Coaching Alliance (PCA) Double Goal Coach Certification. In addition, each coach must pass the Connecticut New York Youth Lacrosse Association (CONNY) rules test, pass a criminal background check and be a US Lacrosse member. Our Coaching Director is Amy Alvord. Amy started her lacrosse career in Simsbury, CT where she broke school records for career and season goals scored. A 3x All-American midfielder at William Smith College, she helped bring the Herons to four NCAA finals. 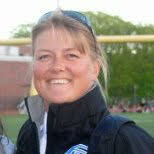 In 2003 Amy moved to Hamburg, Germany to direct a new Women's lacrosse program. Before leaving in '09, she lead the Hamburg Warriors to three back to back National Championship titles, and are now the largest program in continental Europe. Upon her return to the US, she coached Fairfield Ludlowe High School to the Division II State Championship, including coaching three All-state players and started her career with Westport PAL. Amy has devoted her coaching skills to youth programs and enters her 3rd year as Coaching Director for Westport PAL Girls Lacrosse. In the off season, Amy coaches with the CT Grizzlies club program, runs camps at Staples High School through Gamebreaker Lacrosse and head coaches at Sono Fieldhouse in Norwalk.